Sometimes we find ourselves holding on to something we know we need to let go of. And sometimes, we find that even though we have done a lot of healing around something, there is still more to let go, forgive, and release. How do we seek peace at times when we find our wounds are being touched? Begin this practice by taking three more conscious, deeper breaths. Feel your feet on the floor or the ground. Trust and believe that you can let this go into bigger hands, and it can be healed. 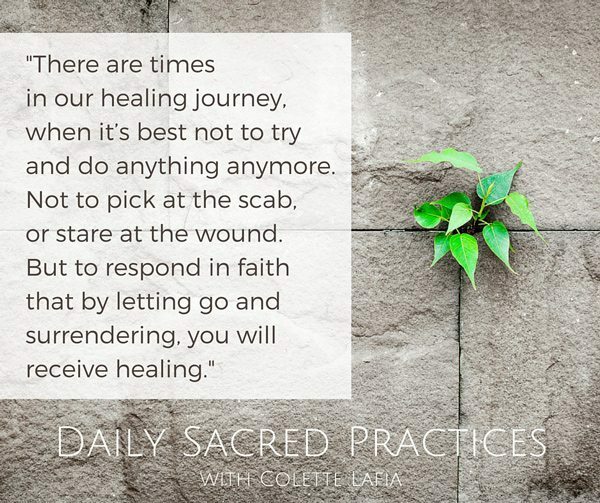 There are times in our healing journey, when it’s best not to try and do anything anymore. Not to pick at the scab, or stare at the wound. But to respond in faith that by letting go and surrendering, you will receive healing. Sometimes, we need to step out of the minute details of everyday life and give ourselves some breathing room. Through habit we get caught up in reviewing our lives—from past decisions to present situations. 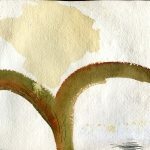 In all of this, our experience of the sacred can get lost. At times like these, it’s helpful to invite some of the largeness and openness of life into these small and particular details. We need to see and to feel how we’re connected to all of creation, to expand our sense of our lives and ourselves in order to grow in our capactity to become more generous with ourselves and others. Feel your feet on the ground and your back against the seat. Take a few minutes to settle into yourself. 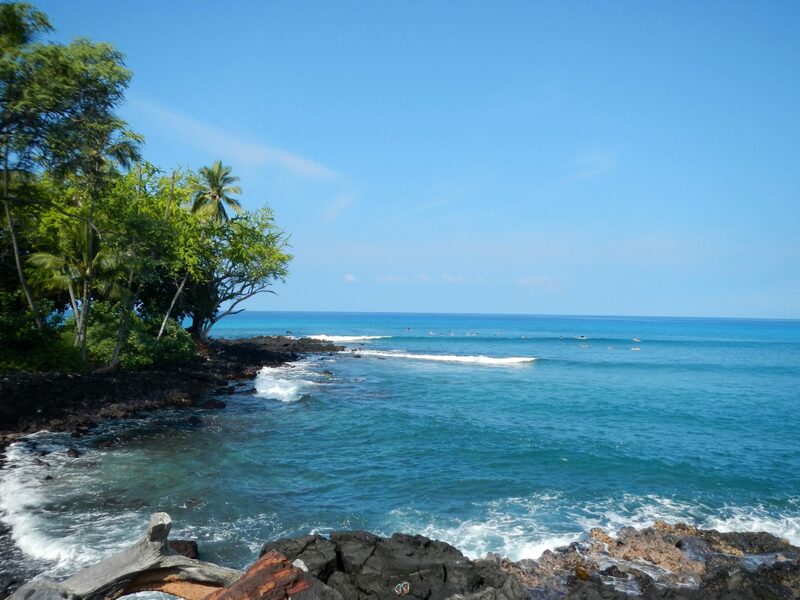 Now, gaze at this picture of the ocean; allow yourself to feel the salt air on your cheeks, hearing the waves crash against the rocks, and see the turquoise blue of the water. 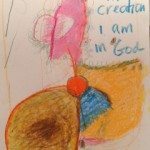 I invite you now to use this image, and slowly mediate on the first line from Psalm 150 as a springboard for praying and meditating your way into expansiveness. The sky, the ocean, the flowers, the trees, the trees—the infinite riches of the natural world—are the holy place where you are living every day. Taking time and appreciating the gifts of the natural world are ways of praying. Praise him in his great expanse. Connect with the power of praise and gratitude as a way to expand yourself and your consciousness, and notice how good it feels to connect with creation. Permission doesn’t sound like a very spiritual word, but I’ve come to realize it’s what allows us to say YES. We can give ourselves permission to listen to our desires, to fulfill our longings, and to care for our needs. Yet so many of us keep our desires tucked away, unfulfilled. 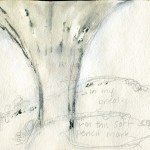 This creates a pressure that chisels away at our souls, leaving us feeling disconnected from ourselves and Spirit. 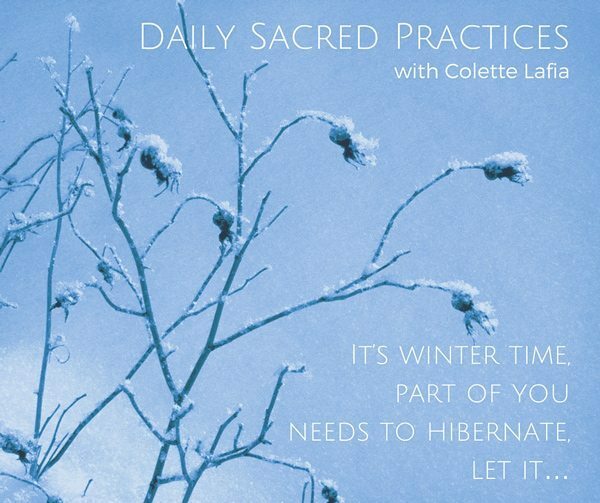 Experiencing the Sacred is all about connecting with the life impulse that nurtures, feeds and cultivates the creative force within us. So we must ask continuouslly ask ourselves this: What gives us life? 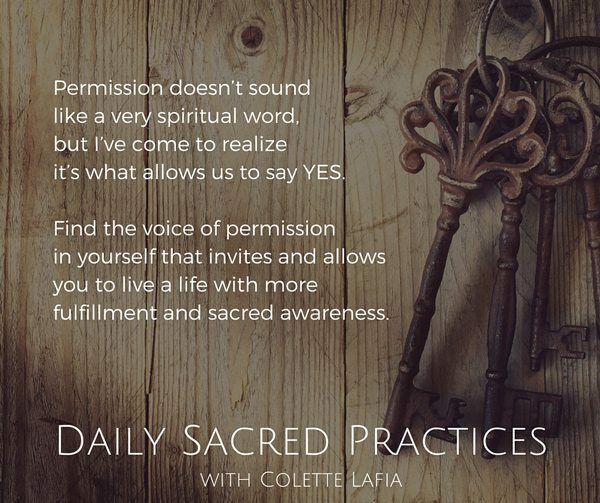 In this sacred practice, I am inviting you to find the voice of permission in yourself that invites and allows you to live a life with more fulfillment and sacred awareness. Begin with intention. Take three deep breaths, and with each breath feel your body relax. Becoming more relaxed in the body allows us to become more receptive. Now, slowly say the word permission. Then repeat it, permission. Let the word fill you up, like helium filling a balloon. Ask yourself: What would I like to give myself permission for? Don’t rush in with an answer, but let your heart speak. Sit with the question for as long as you like and see what arises. Look at what you’ve written. As you read your words, notice what deeply resonates for you—not what you think you should do, but what makes your heart leap. Now, in a prayerful and mindful way, bring this desire into the sacred moment. Ask for guidance to show you how to bring this into your daily life. Is there something you could do right now, or even today, to give yourself permission to live with more fulfillment and joy? Every journey begins with a step. 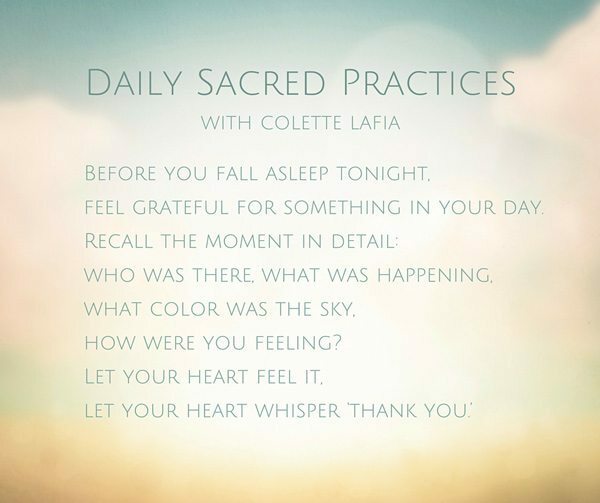 These Sacred Practices are designed as prayers. You can give them as much time as you have in the moment, and they can be repeated. In the midst of all the noise both around us and within us, from our lists of things to do, to the constant bombardment of media, there is another voice waiting to be heard. As we learn to dwell inside, and discover our interior lives, we allow our lives to unfold. Come into this sacred moment. Take three deep breaths. Let yourself find a calmness. It’s not far away. Come home into yourself. 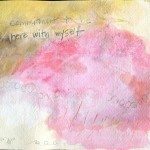 Repeat the mantra: I am at home in myself, as you sink more into yourself. Feel how restful it is to dwell in yourself—even for a few moments. Now, invite the Divine to dwell with you in your inner room: Dear One, Be at home in me. You may have an image, or a feeling of presence, or a wave of energy. Relax and be with it. Close you eyes if you’d like and take it in. Create your own prayer for the moment. Stay with what you are sensing and experiencing for a few minutes. Encourage yourself to become more passive and receptive to this interior dwelling. Connect to the interior place from which you are building a deeper relationship, to yourself, to your life, to the Divine, and to others. They are all interconnected and the root is deep within you. Throughout the day, be willing to step inside yourself and discover more of your true self. 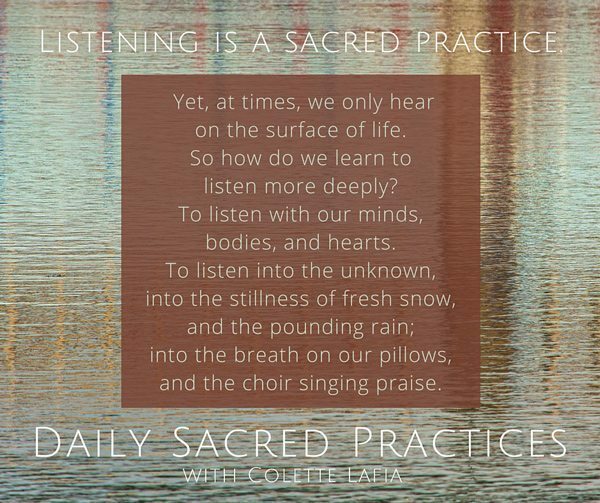 Listening is a sacred practice. Yet, at times, we only hear on the surface of life. So how do we learn to listen deeply? 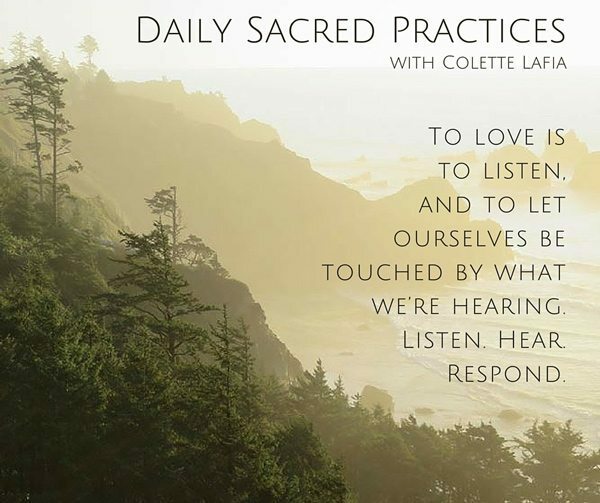 How do we learn to listen to our body, to our heart’s desire, or to our inner stirrings? 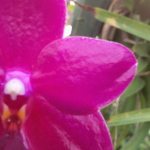 There’s a sensitive way of listening to others, as well, to their joys and sorrows. And what delight there can be in learning to listen to the sounds of nature–the wind, the birds, the ocean. To love is to listen, and to let yourself be touched by what you’re hearing. 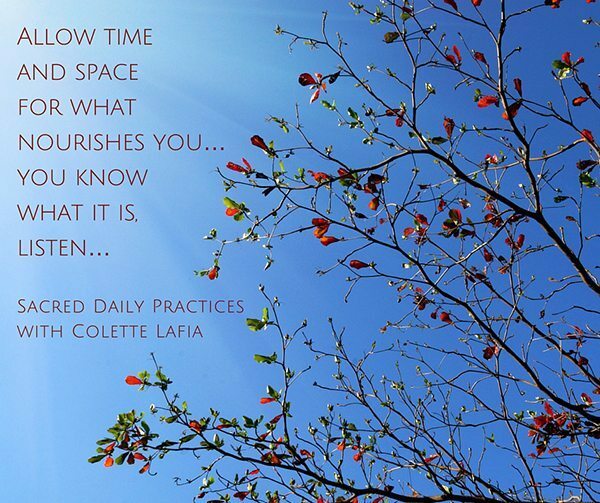 Take time right now, and listen to yourself. Stop what you’re doing, take a few deep breaths, and arrive in this sacred moment. Listen to your breath as you inhale and exhale. Let the sound of your breathing fill you completely. As you settle into yourself, ask yourself: How am I feeling? Sit with the question for a few minutes and really tune into yourself. Let the true answer emerge from inside of you–from your heart. If you’re feeling sad, receive it. If you’re happy, receive it. If you’re angry, receive it. Invite the Divine into this moment with you: Dear God, I’m feeling angry right now. Dear God, I’m feeling happy right now. Let the Divine be present with you, and be willing to bring all of yourself into this sacred moment. Be open and say: I’m listening, Sacred One. 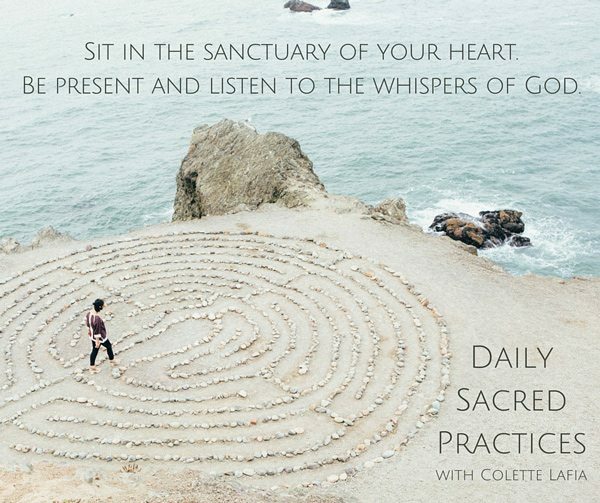 Sit for a few minutes quietly listening to what’s stirring in your heart. End this practice with a few deep breaths, listening to the sound of your breath as it fills all of you. Throughout the day, pause and listen–when you hear a bird singing in a tree, when you hear a song you like, or when you hear your body asking you to sit for a moment and take a break. 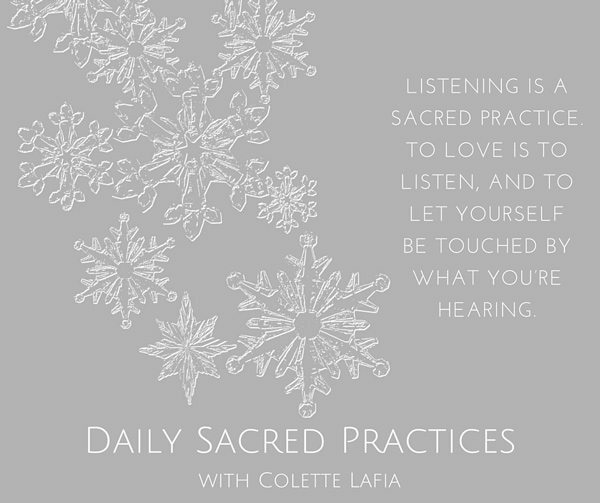 Listening to yourself, to others, and the Divine, forms the heart of sacred awareness in your daily life. There may be moments in the day when we don’t feel good about ourselves—for a lot of reasons. In those moments, can we find a way to bring tenderness and love to ourselves? 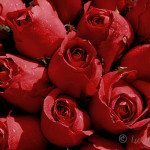 Here is a practice that offers you a way to respond with love, rather than judgment. It’s adapted from the book: The Sacred Place of Prayer, by Jean Marie Dwyer, OP, from her chapter on St. Catherine of Siena, the 14th century mystic. Allow yourself to recognize that you’re not feeling good about yourself in this moment. You don’t even need to analyze it, since like most of us you probably know the origins of this habit. Just be willing to be present to it. Catherine believed that in the gentle mirror of God, we could see ourselves differently than we usually see ourselves. She believed that our reflected image in God’s mirror is always positive and healing. The invitation here is for you to see yourself in the gentle mirror of God. Find a mirror, even in the bathroom at work, and take a moment to gaze at yourself. At first you might get caught up in commenting on your hair, your skin, etc., but keep going and look at your eyes in the mirror. 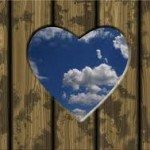 Can you look at yourself from your heart? For just a minute, look into your eyes and at the same time look into the gentle mirror of God, in which you see yourself reflected. You can repeat the mantra: In the Gentle mirror of God, I see my reflection. Pause for a moment and take that into your heart, letting love and compassion fill your heart. 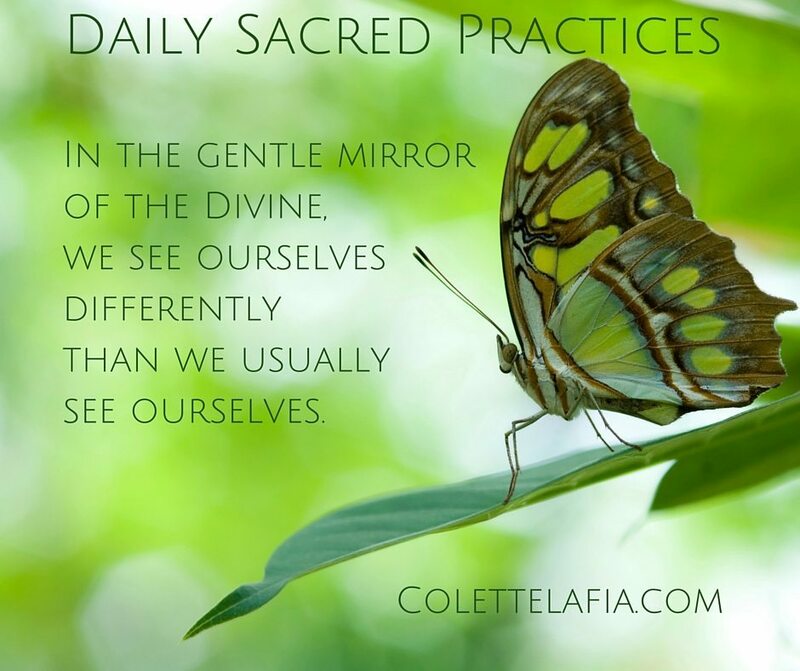 Seeing yourself as sacred can change the way you know yourself. When we are putting out a lot of energy, interacting with many people, and constantly responding to demands, we can begin to find ourselves off balance and drained. How can we renew our energy, and stay connected to ourselves throughout the day? First, be willing to stop and acknowledge what you’re feeling. There is great power in the art of stopping. Sit comfortably, with your back against a chair, bench, or car seat. Feel your feet firmly planted on the floor. Take three deep, natural and gentle breaths (never force the breath). Come into this sacred moment. With your attention on your breath, begin to focus on your feet. Feel your feet planted on the ground, even through your shoes. Take several more deep breaths and let your awareness drop into your feet. Now, focus on the right foot–notice the heel, the arch, the toes, the top of the foot. And the left foot–the heel, the arch, the toes, the top of the foot. Feel the presence of both your feet, letting them sink into the ground. Now, keep your focus on your feet for five minutes, using the breath to support you. Notice how you settle back into yourself as you keep your attention on your feet. This is a simple but powerful practice to bring you back into yourself and connect within. You can do this at work, in the car, or at home–anytime and anywhere! This is a very portable practice, which can have a wonderful calming effect and reconnect you to yourself in the present moment. Remember that your feet are the ground of your being. God is the ground of your being. Feel the connection. Between work, family, and the 1001 items on our To-Do Lists, rushing around has become a way of life for us all. 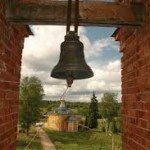 But the more relaxed you are in your body, the more you’ll flow through the day and allow yourself to live in communion with the sacred. Yes, you can be busy and be more relaxed. It just takes awareness and practice. Once you’ve got the hang of it, this practice can be done throughout the day–you don’t even need to stop what you’re doing or take time out. Find a comfortable place to sit and sink into this present moment. Take three deep breaths. Move your attention away from your mind and into your body. As you continue to follow the flow of your breath, begin to scan your body. Start with your face: your eyes, your checks, your jaw. Then move to your arms, your hands, your chest. Feel your back against the chair: scan your upper back, then your lower back. Now, notice your legs, the weight of your thighs, your calves and your feet. Feel your breath moving throughout your body. Notice any places of tightness or holding on. You might notice a gripping in your jaw, in your throat, or in your lower back. Or you might notice a clenching in your hands. See if you can find some release by breathing into your body. Perhaps your lower back can relax against the back of your chair; your shoulders can drop away from your ears, or your hands can open and rest on your lap. Throughout the day, you can notice this holding in your body and simply release. It’s a small action, yet powerful! You can do this in a meeting when you notice you are sitting on the edge of your chair. You can do this when you’re our walking and notice that your hands are tightening into a fist. You can do this when you’re driving and notice that your jaw is clenched. When you become aware of any tension or holding in your body, breath into it, relax, and release it. 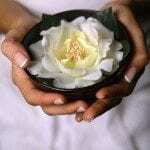 The more relaxed and at ease your body feels, the more receptive it is to becoming a holy temple. Give yourself (and your body) this sacred gift. Every day is like taking a short trip–we have places to go and things to do. So, no wonder we can get lost at times during our day–and even ask ourselves: What am I doing? Where am I going next? In many ways, we have to establish our own guidebook for daily living. One practice that can help us to stay on track or, if we’ve wandered off course, to get back on track is using a touchstone to anchor us. Creating a few phrases or mantras that can help us, can be extremely powerful. Begin your day with a phrase that connects you with your awareness of the sacred. 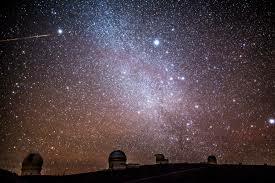 For example, when I wake up I try to always say: Dear God, thank you for the sleep and the rest that I have received. May I love you today in all that I do, all that I think, and all that I feel. I actually began this practice at the height of my insomnia, as a tool to anchor me after a difficult night. So this isn’t all about feeling good, it’s about focusing attention on what is hopeful and meaningful. Lord, Make me an Instrument of Your Peace; or Peace. All is Well and All Shall Be Well. Or, you can simply wake up and say: Thank You for this new Day. 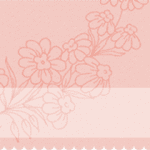 Write your phrase down and keep it in a visible place–near your bed, on your dresser, on your bathroom mirror. You might not remember to say the phrase until lunchtime, and that’s just fine. The more you repeat the practice, the more of a habit it will become. Another good time to create a touchstone in your day could be when you get to work, after you exercise, or before dinner. I always sit quietly with my students and take three deep breaths before we start library time. And after I swim, as I’m packing my towel and things, I always say: I am thankful for the time, health, and motivation to swim. All is gift, and may I give from what I have received. Another good time to use a touchstone in the day is when you sit down for dinner. I always say: For this food we are about to receive, I am truly grateful. Find organic places in your day to insert your anchor phrases. Find a phrase that feels honest–don’t say what you think you should say. May I give from what I have received. May I be a loving presence in the world today. Now, take a moment and write down a few phrases or prayers that have meaning for you. We spend so much of our time sitting on the edge of our seats, waiting to get to what’s next. Our thoughts race ahead, leaving us distracted and unable to fully articulate our needs or how to meet them. We’re perpetually leaning forward, itching to move on to the next item on our To-Do List. What about discovering what it’s like to lean back—to sink into a moment, to savor it, to allow your senses to relax and release into what you’re encountering. Yes, some resistance can arise to the feelings we’re having, the people we’re interacting with, or the situations we’re experiencing. That’s life. 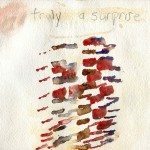 But what would it be like to lean back into the moment and deeply experience it—to lean back into your meal and taste your food, to lean back into your office chair and be at work, to lean back into your heart and listen to what’s happening around and within you, to lean back into yourself and become quiet for a while? Learning to lean back into your life allows you to become more relaxed and more receptive. It can actually release a lot of tension in the body. Right now, without being critical of yourself, notice how you’re sitting. If you find yourself sitting forward on your seat, gently adjust your body and allow your back to relax into the chair. Take three deep breaths. Soften your shoulders. Lean back into the chair, the church bench, the park bench, your car seat. Throughout the day, notice the way you sit—at meetings, at your dinner table, at church, or while watching a movie. Sometimes, when we think we’re relaxed, we’re still holding or gripping (experiencing tension or tightness) in our back or neck. When you notice this gripping, just invite yourself to lean back, release into what’s holding you, and take a deep breath. Check in with your body periodically. Whether you’re walking, standing and talking to someone, or bending over and pulling weeds, notice any tension or tightness in your body. When you notice this tension—this gripping—take a few deep breaths and invite yourself to lean back into the moment. Release into what’s holding you. Sometimes, we have to lean into what is uncomfortable and see if we can find a way to settle down. Leaning back is a practice you can easily use throughout your day to notice where you might be resistant, and to see if you can find some release through any degree of surrender. Notice how the practice of leaning back will bring you more ease throughout your day. Learning to give ourselves a break, sometimes for just 5 minutes, is a great way to shift our perspective, shake off negative energy, and quickly restore ourselves. Yes, we would love to be on a plane to Hawaii, but for most of us that is not possible in this moment, so we do what we can, not what we can’t. We stop waiting for a magic moment, but allow this real moment, right now, to be our magic moment. Take three deep breaths. Come into this sacred moment. If you need to laugh, read these jokes or watch a funny video. If you need to feel the beauty of nature, watch the sun rise or a flock of birds move across the blue sky, or look at flowers. If you need to sing, listen to this music. If you need to be still, enter into this contemplative moment. Use your senses as a portal into a restorative moment. Feel the gift of letting yourself stop doing. The gift is being offered to your right now. Pause. Be still and know that I am God.